The spice is gone from Buffalo Wild Wings. The restaurant chain left investors feeling queasy after revealing a sales slump and gloomy prospects for the next few months. Buffalo Wild Wings (BWLD)stock plummeted 14% on Wednesday, its deepest dive in six months. Buffalo Wild Wings blamed its results on cautious spenders, rising wing costs and higher labor expenses. "The macro environment for casual dining has had a rough quarter and a rough couple of quarters," CEO Sally Smith told analysts during a conference call late Tuesday. "I just don't think there is a robust consumer out there." However, several users on Twitter told CNNMoney the real problem is the restaurant chain's wings don't actually taste that great. Either way, Buffalo Wild Wings said same-store sales at owned restaurants fell 1.7% last quarter. By comparison, they were up 6% in the same period of last year. Overall sales were up by a healthy 15%, but that was because Buffalo Wild Wings added new stores. 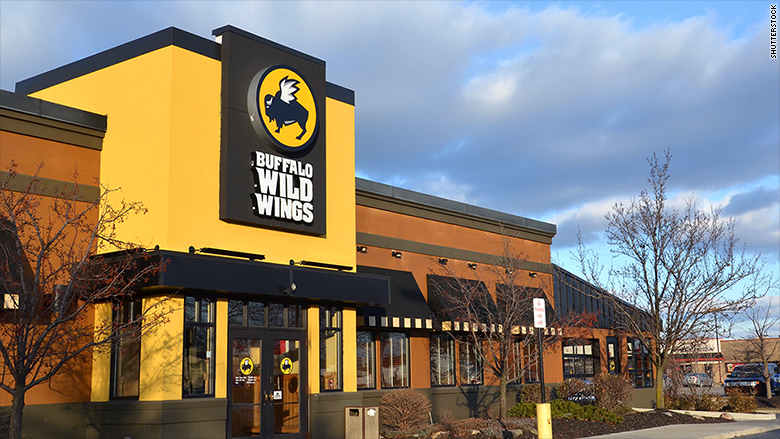 Buffalo Wild Wings warned sales are likely to flat line in the second and third quarters before returning to growth in the fourth quarter. The company dimmed its full-year earnings outlook below Wall Street's targets. One major headwind for a chain that has wings in its name: the price of traditional wings is going up. Buffalo Wild Wings said it spent 3% more per pound on chicken wings than the same time last year. That's part of the reason the company plans to raise menu prices by 3.5% in the second quarter. But at a time when consumers are already being cautious about their spending, is this a good move? "We understand there is a price sensitive consumer out there right now," James Schmidt, the company's chief operating officer, told analysts. He explained that the price hikes are targeted mostly on beer. The restaurant chain is doubling down on promotions around lunch, happy hour, Wing Tuesday. Schmidt said most consumers won't even notice the difference. Like other major companies, Buffalo Wild Wings is also balancing the need to keep prices low with the need to pay workers more amid the improving jobs market and minimum wage hikes. "We're seeing wage pressure," said Smith, who previously warned that a $15 minimum wage could hurt teen jobs.